With nearly 500 Orlando area hotels to choose from, there are plenty of properties that can fulfill all of your budget wishes — in some cases, simultaneously! 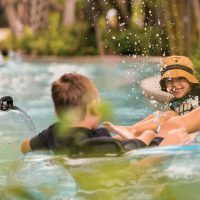 These cheap family resorts in Orlando represent the finest budget offerings for some of the most common family travel needs, and include recommendations for those visiting Disney World, Universal Orlando Resort and SeaWorld Orlando. 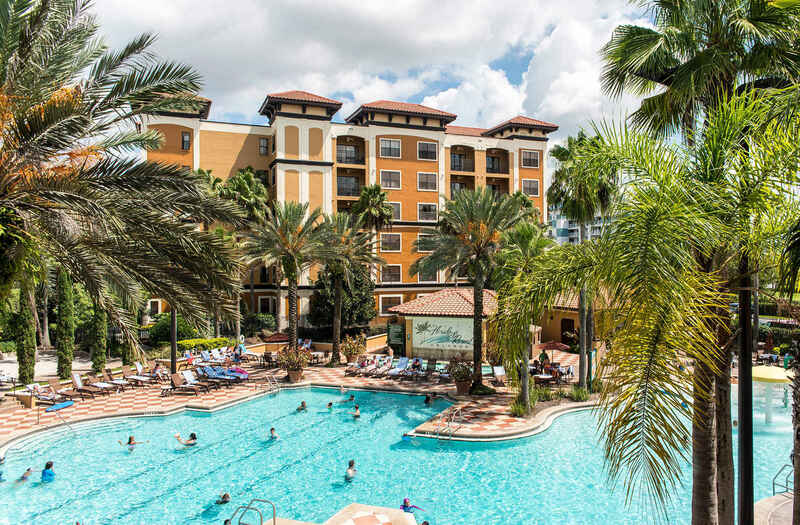 The Sheraton Vistana Resort Villas-Lake Buena Vista features seven heated swimming pools, five children’s pools, four playgrounds, two game rooms, mini-golf and multiple sports courts. 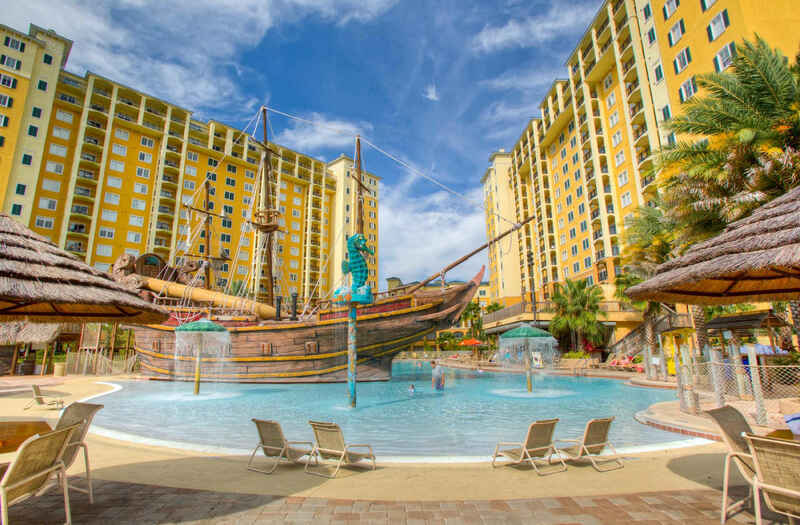 Pool parties, arts and crafts, candy bar bingo, sunrise movies, and mermaid and dolphin swimming experiences are among the fun-filled family activities at this cheap family resort in Orlando. Lodging options include one-bedroom, one-bathroom villas, which range from 324 to 471 square feet and accommodate up to four guests. These units offer a kitchenette, a washer and dryer and a separate living area. For larger families, 1,025-square-foot two-bedroom villas sleep six to eight. Two-bedroom units feature two bathrooms, a full kitchen, a washer and dryer, a living room and a private screened patio or balcony. Onsite parking is free. For rental guests, shuttle service to Universal Orlando Resort, SeaWorld Orlando and Disney World, which is just 3 miles away, is available for an additional fee. 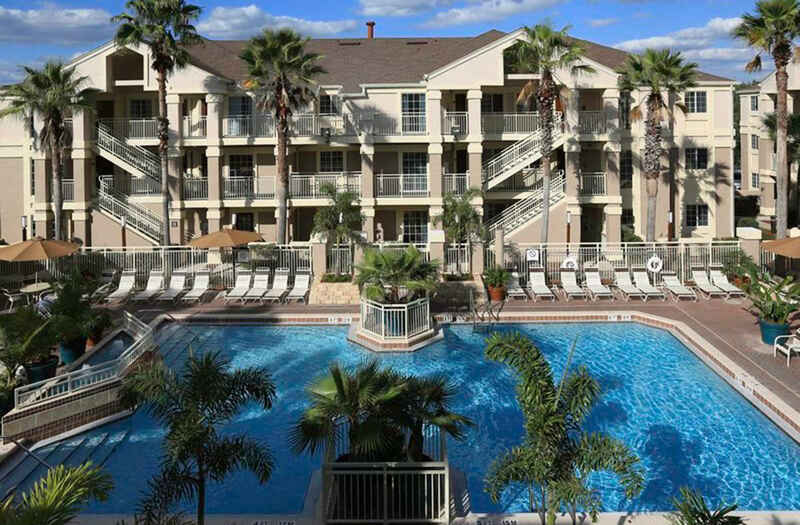 Opened in 2005 and adjacent to Lake Buena Vista Factory Stores, this condominium-style property is minutes from area theme parks and offers spacious accommodations, a pirate ship pool with a plunge slide and shallow play areas, family-friendly dining options, and an onsite spa where you can treat your young royalty (ages 4 to 12) to a Princess Makeover or a Pirate Takeover. Families have a choice of one- to four-bedroom condo suites, all of which feature a full kitchen, a washer and dryer, and a living room with a private furnished balcony. One-bedroom, one-bathroom suites are a spacious 800 square feet and sleep four. Two-bedroom, two-bathroom suites are 1,084 square feet and sleep six. Three-bedroom (1,250 plus square feet) and four-bedroom (1,800 square feet) suites accommodate up to eight and 10 guests, respectively. Lake Buena Vista Resort Village & Spa also offers a game room and organized children’s activities. A daily resort fee covers Wi-Fi, parking, use of pool towels and daily shuttle service to Disney World, SeaWorld Orlando and Universal Orlando theme parks. Housekeeping services are available for an additional fee. 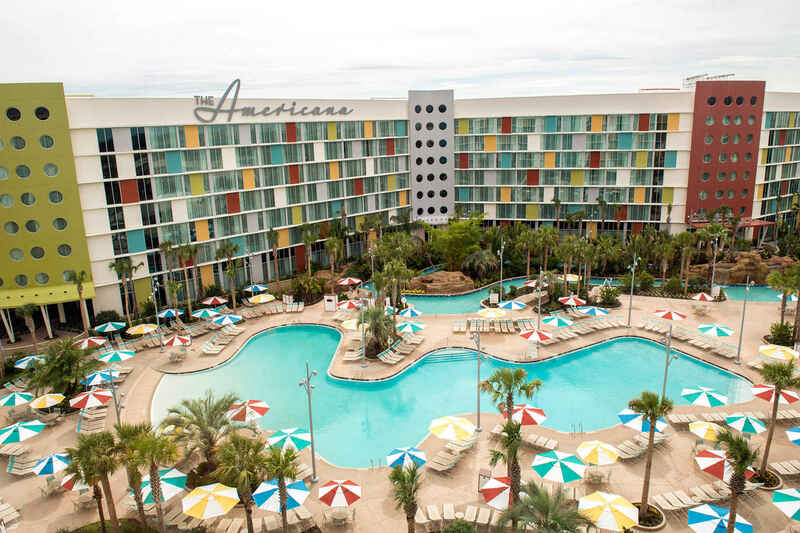 You won’t get front-of-the line Universal theme park attraction access by staying at Cabana Bay Beach Resort, one of Universal Orlando Resort’s budget-priced lodging options. However, if you’re looking for cool retro theming and access to other perks like early theme park entry, complimentary theme park shuttle bus transportation and resort-wide charging privileges at a fraction of the cost of booking a deluxe accommodation, a stay at Cabana Bay might be right for you. Room options include 300-square-foot standard rooms, which sleep up to four, and 430-square-foot family suites, which feature a kitchenette, a living area and an extra-large bathroom; they sleep up to six. Cabana Bay offers plenty of family-friendly draws, including a food court and themed pools with fantastic features like a lazy river, zero-entry access, a waterslide, splash pads, a sandy beach and organized poolside activities. An onsite bowling alley and game room offer all-weather fun. 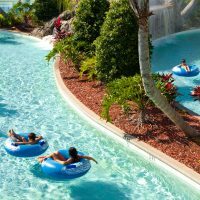 There is an additional charge for tube rentals at the lazy river, as well as a daily parking fee. Bring the kids to Floridays, where you’ll find lots of space, friendly service and the comforts of home — all for a bargain price. Two resort pools — including a family pool with interactive fountains and a manmade beach — and an onsite restaurant are welcome sights at the end of a long day at the theme parks. Scheduled activities — from arts and crafts to dive-in movies and DJ pool parties — help to keep the kids happily engaged while mom and dad get a needed break. Fully furnished two-bedroom, two-bathroom suites sleep six comfortably and are around 1,020 square feet and contain a full kitchen. Three-bedroom, two-bathroom suites are around 1,300 square feet and add two twin beds in a third bedroom to sleep eight. All suites feature a fully equipped kitchen with a dishwasher and a washer and dryer. A daily resort fee covers resort-wide Wi-Fi, parking and scheduled shuttle service to Disney (Epcot), Universal Orlando, SeaWorld Orlando and Aquatica. Housekeeping service, which includes towel replacement, garbage removal, and bed making, is complimentary. Pets 25 pounds and under are welcome for a fee. 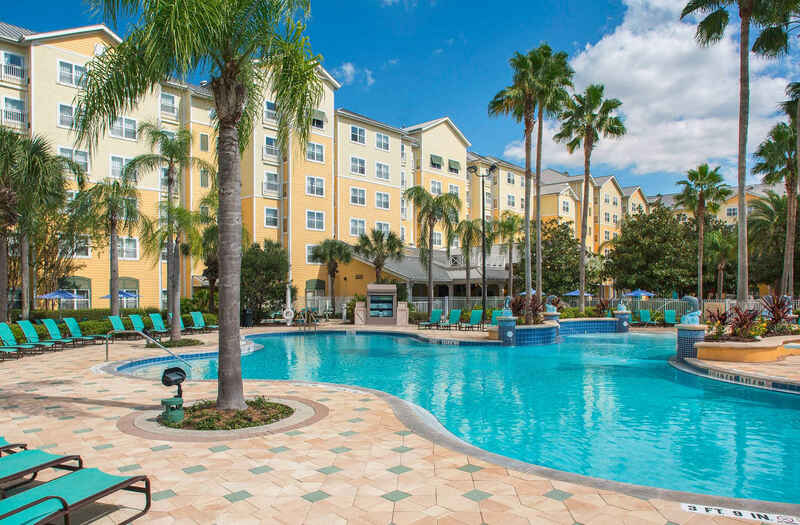 Less than five minutes from Disney Springs, this award-winning, all-suite property features an attractively designed pool area, free breakfast, mid-week happy hour, free Wi-Fi and spacious accommodations, all at budget-friendly prices. Two-bedroom, two-bathroom suites average 750 square feet and sleep up to eight. One-bedroom, one-bathroom suites (550 square feet) sleep up to four and feature a king-size bed in the master bedroom and a double sleeper sofa in the living room. All accommodations at the Staybridge Suites Lake Buena Vista feature a full kitchen, a dining area and a separate living area. A guest laundry facility is onsite. Free Disney World transportation (one-round trip per guest, per day) is included in the nightly rate at this cheap family hotel in Orlando. 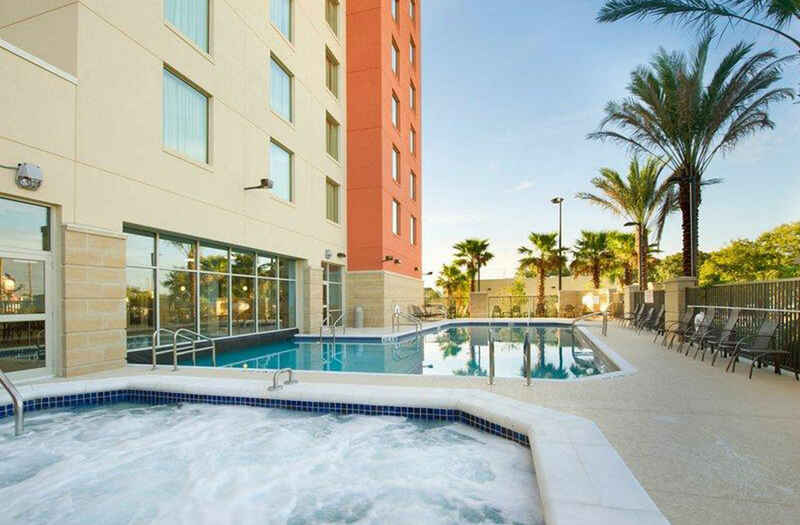 If you’re looking for extra space for your large family in the full-service atmosphere of a familiar hotel brand, Residence Inn SeaWorld offers one of the best values in Orlando. An Official SeaWorld Orlando Hotel Partner, this cheap Orlando family resort offers complimentary hot breakfast, free parking, theme park shuttle service and exclusive SeaWorld Orlando front-of-the-line perks. Family-friendly recreational offerings include a basketball court, a game room and a tropically landscaped, zero-entry pool. Suite accommodations are especially spacious for the price, and feature full kitchens. Families can choose 616-square-foot family suites, which have one bedroom and one bathroom and sleep and up to five, or 900-square-foot two-bedroom, two-bathroom suites, which sleep up to seven. Free shuttle transportation to SeaWorld Orlando, Aquatica, Discovery Cove and Universal Orlando is provided. There is a pool bar, as well as a Pizza Hut Express onsite. Guests can also take advantage of pre-arranged grocery delivery service. For a fraction of the cost of a stay at a theme park resort, you can spread out in a spacious two-bedroom, two-bathroom or three-bedroom, three-bathroom villa-style suite at WorldQuest Orlando Resort. 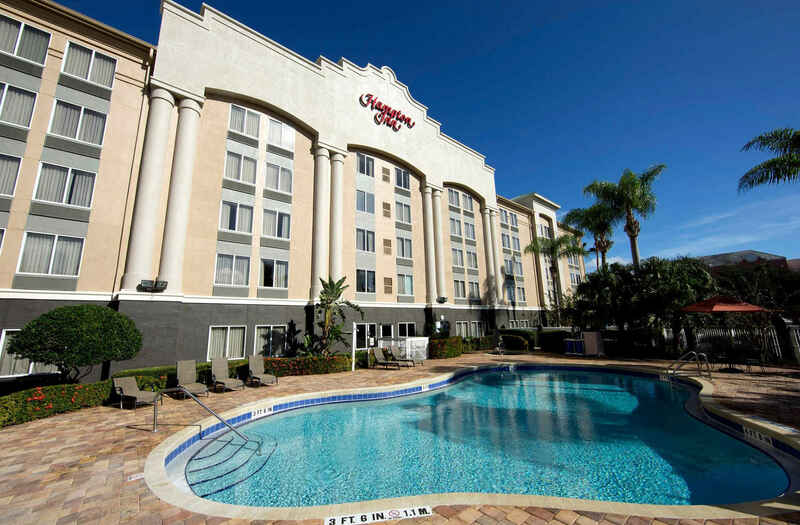 Situated just 2 miles from Disney World, this cheap Orlando resort features a large heated pool with a tiki bar, free parking and complimentary Disney World theme park (Epcot Ticket & Transportation Center) shuttle service. World Quest is 8 miles from SeaWorld Orlando and 12 miles from Universal Orlando Resort. All accommodations are equipped with a fully furnished kitchen, a washer and dryer, a furnished balcony and a living and dining area. Several levels of optional housekeeping services are available for a fee. 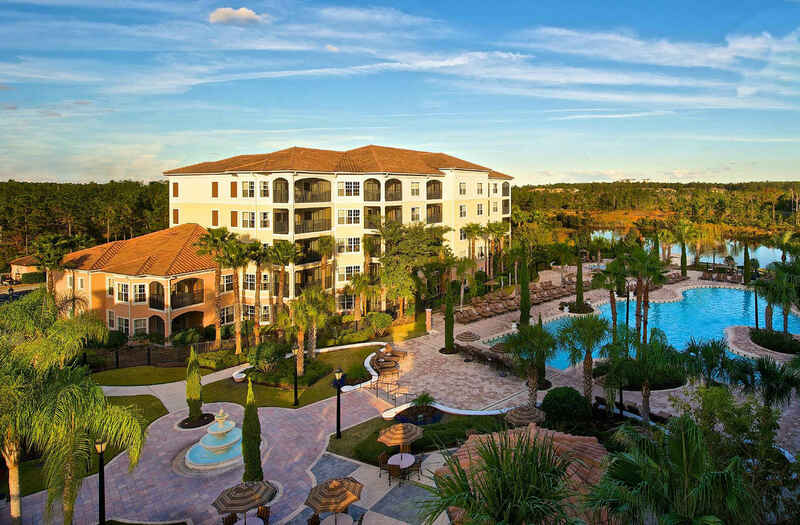 Overlooking spring-fed Lake Bryan and less than 1 mile from Disney World, this peaceful condominium-style complex makes a relaxing base for families looking for extra elbow room at affordable prices on their Orlando vacation. Offering one- and two-bedroom condominium-style suites, Blue Heron Beach Resort features a large outdoor pool area with a heated pool, a tiki bar and a separate gated kiddie pool, and a game room. Guests can take advantage of water sports rentals, delivered to the resort dock by Buena Vista Water Sports, as well as mini-golf at Hawaiian Rumble, adjacent to the property. Families visiting Universal Orlando theme parks rave about this budget-friendly property, which offers more than the usual amount of free perks for traveling families. Guests enjoy free hot breakfast, free cocktail hour and dinner with kid-friendly food options, free soda and popcorn from 3 to 10 p.m., free parking and free shuttle service to Universal Orlando Resort. Accommodation options at the 238-room Drury Inn & Suites Orlando include standard rooms (king or queen), which sleep up to four and two-room suites, which sleep up to six with two queen-size beds in the master bedroom and a queen-size sleeper sofa in the living room. All rooms contain a microwave and a mini-fridge. Pets are welcome (up to two per room) for a $15-per-day cleaning fee. An indoor/outdoor pool keeps the kids entertained. A Whole Foods Market is conveniently located across the street from the property, and Chick-fil-A and Wendy’s are nearby. Free hot breakfast with Mickey Mouse waffles, free parking, free Wi-Fi and complimentary theme park shuttle service are among the most popular guest perks at Hampton Inn Orlando/Lake Buena Vista. 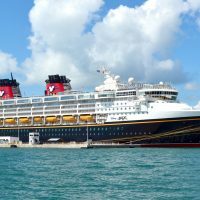 Located within a mile of Disney World, the hotel offers 147 guestrooms, a fitness center and daily scheduled shuttle service to all Disney parks, as well as Lake Buena Vista Factory Stores. Guestrooms feature one king bed or two queen beds, and are equipped with a microwave, a mini-refrigerator and a coffeemaker. After a day at the theme parks, the kids can swim in the outdoor pool, then enjoy fresh-baked cookies and hot chocolate, which are available every evening in the hotel lobby.